Here students learn about the animals and plants near the beach. The activity is designed to encourage the students to be more environment friendly. Education is the most effective tool for reducing fertility rates: For example, one extra year of education in Madagascar increased spaces between births by 0.5 years. Environmental education can increase green knowledge: 73% of 78 countries’ curricula mention ‘sustainable development’, 55% mention ‘ecology’ and 47% ‘environmental education’. Sustainability practices continue outside of school: A 2008 survey reported that over 40% of global executives thought it important for their companies to align sustainability with their business. Education is crucial for disaster preparedness: If education progress is stalled, it could lead to a 20% increase in disaster-related fatalities per decade. Education systems should not encourage unsustainable lifestyles and can learn much from indigenous communities: They should respect local cultures and plural knowledge systems, and provide instruction in local languages. Individual and collective human actions have put immense strain on the planet and the life forms it supports. Since humanity is clearly contributing to environmental degradation, rapid biodiversity loss and climate change, its actions must also provide the solutions to these challenges. Education can play a major part in the required transformation into more environmentally sustainable societies, in concert with initiatives from government, civil society and the private sector. Education shapes values and perspectives. It also contributes to the development of skills, concepts and tools that can be used to reduce or stop unsustainable practices. Education’s multifaceted role in sustainability is not always positive. It can contribute to unsustainable practices, including overconsumption of resources, and exacerbate the loss of relatively sustainable indigenous knowledge and ways of living. Education may need to be shaped and transformed to ensure its impact is positive. Three of the most common understandings of how human behaviour leads to environmental degradation involve demography, modern lifestyles and individual behaviour. The demographic explanation is that there are simply too many people on the planet: the global population tripled between 1950 and 2015, and is expected to grow by another billion to 8.5 billion by 2030. The modern lifestyles concept focuses on higher per capita resource consumption by people in urban areas and wealthier countries. Countries where living standards have rapidly increased have seen a near doubling of their ecological footprint in the past two decades. 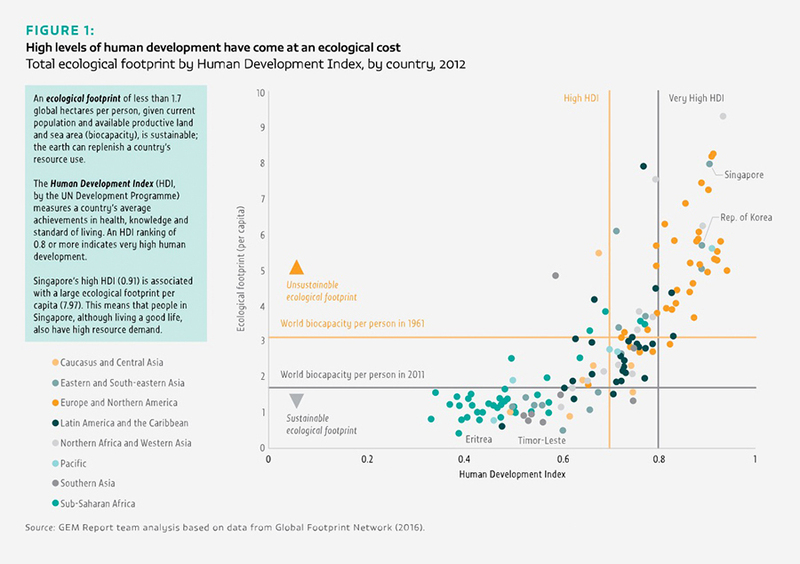 In 2012, most high income countries had an unsustainable ecological footprint. The individual behaviour explanation sees individuals as both the source of environmental problems and their potential solution through, for example, policies that encourage recycling, bicycle use and fuel-efficient cars. influence individual and collective environmental behaviour through contemporary, traditional and lifelong approaches to learning. Schools help students understand a given environmental problem, its consequences and the types of action required to address it. Knowledge about the environment is increasingly incorporated into formal school curricula. Analysis of 78 national curricula shows that 55% use the term ‘ecology’ and 47% ‘environmental education’. In India, for example, following a Supreme Court ruling, government agencies in 2003 started producing extensive content on environmental education, which has resulted in over 300 million students in 1.3 million schools receiving some environmental education training. Environmental education encourages sustainable lifestyles, waste reduction, improved energy use, increased public transport use, support for pro-environment policies, and environmental activism. In Estonia and Sweden, where sustainable development is part of the curriculum, students were more likely than their peers in countries without such content to give correct answers on environmental science in the 2006 Programme for International Student Assessment. Some schools have adopted a ‘whole school’ approach to environmental education. Research on such schools in England (United Kingdom) show improvements in the schools’ ethos and students’ health and learning, and reductions in the schools’ ecological footprints. Traditional – especially indigenous – knowledge in such areas as agriculture, food production and conservation has played an important role in environmental sustainability for centuries. Numerous examples of indigenous communities’ traditional land management practices are becoming recognized globally as excellent approaches for conserving biodiversity and maintaining ecosystem processes. In Colombia, the Council of Sustainable Settlements of the Americas is putting into practice the concept of bien vivir (living well), which recognizes the contribution of indigenous communities, for example in urban eco-barrio projects, traditional sustainable villages and sustainability education centres. Local and indigenous knowledge have contributed to ecosystem functioning, disaster early warning systems, and climate change adaptation and resilience. The Alaska Rural Systemic Initiative in the United States, in which students interact with indigenous elders, is an example of schools learning from indigenous knowledge. Providing school instruction in local languages also contributes to knowledge sharing between generations. Beyond formal education, government agencies, religious organizations, non-profit and community groups, labour organizations and the private sector can all help change individual and collective behaviour. Government-backed campaigns can raise awareness of an environmental problem, point to its causes and signal how people can solve it. In 2015, the Ethiopian government and partners launched a two-year public awareness campaign aimed at encouraging solar lighting products. Religious, cultural and social leaders can help spread environmentally sound values and behaviour. The workplace also is an essential centre for environmental learning. Companies have launched initiatives to reduce their ecological footprints and educate staff and the public about environmental protection. A 2008 Economist Intelligence Unit survey reported that over 40% of global executives thought it important for their companies to align sustainability with their business. Labour organizations have also promoted more sustainable workplace practices. Through public information campaigns, projects, partnerships and green alliances, non-government organizations (NGOs) play a vital part in mobilizing public support for conservation. Web-based campaign groups such as Avaaz, which has 44 million members in 194 countries, help raise awareness on the environment with initiatives such as a two-year campaign to ban bee-killing pesticides. Education enhances people’s resilience to climate-related risks. It also encourages their support for and involvement in mitigation actions. Broadening access to education is more effective against climate change effects than investment in infrastructure such as sea walls and irrigation systems. Female education reduces disasterrelated fatalities. Projections show that if education progress stalled, future disaster-related fatalities would increase by 20% per decade. Communities most at risk from climate-related events are generally in countries where educational attainment is low and unequal.